Chewy dried cranberries lend both sweetness and tartness to these crisp Italian-style cookies and the pistachios! What can I say about the pistachios? 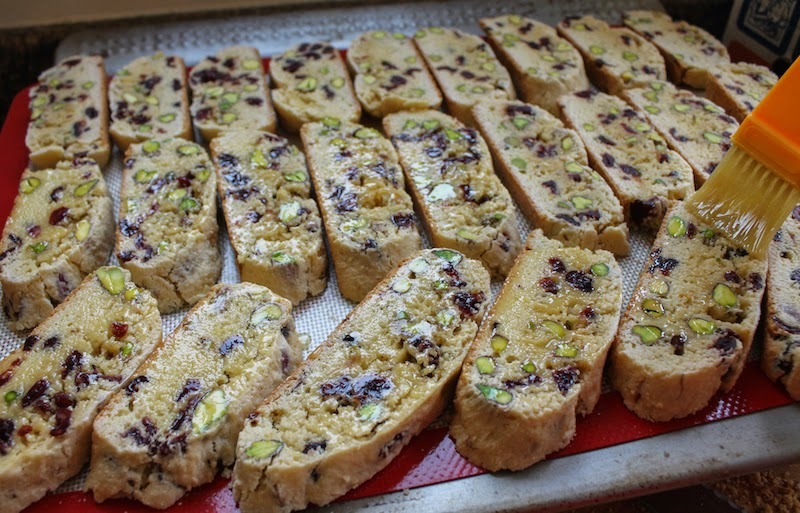 Their color, flavor and nutty goodness elevate plain cranberry biscotti to fabulousness. We were so well-organized! Weeks and weeks ago, Lauren from Sew You Think You Can Cook wrote to ask if I’d like to participate in a virtual baby shower for our fellow blogger, Tara of Tara’s Multicultural Table who was expecting baby number two. 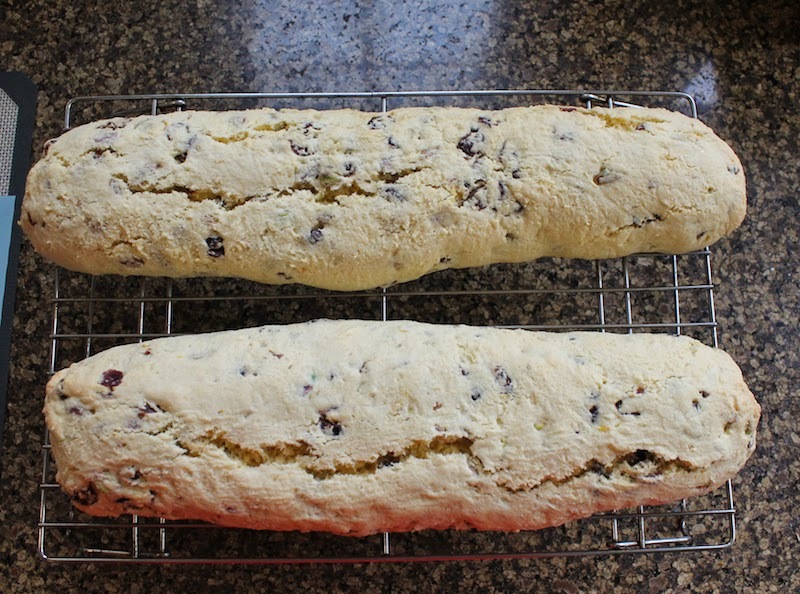 The theme was going to be biscotti because it means twice cooked. You know, like second time with a bun in the oven. Pretty clever, huh? 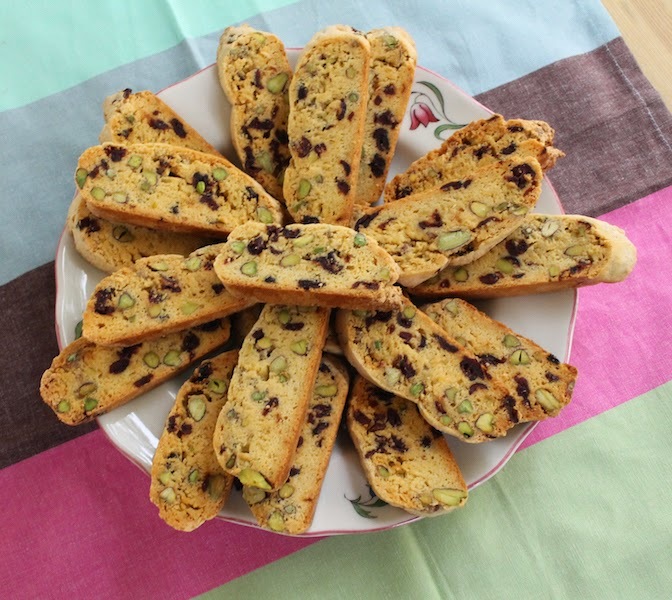 Who could resist the opportunity to make a big deal out of a second baby AND bake biscotti! Not I. This whole thing is a surprise party for Tara, who, as far as we know, doesn’t suspect a thing. But the biggest surprise was for us, when the baby came four and a half weeks early! It’s been so hard keeping the virtual baby shower a secret when we just wanted to be shouting from the rooftops. If you follow Tara on Instagram, (and you should!) you’ve seen a picture of the little one. Adorable! Congratulations, Tara, to you and to your newly expanded family! 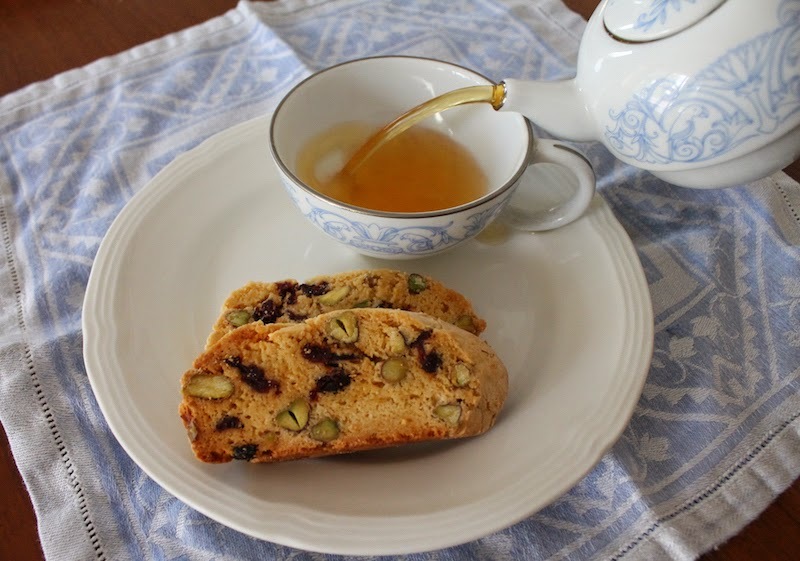 Now let’s bake some biscotti! I had never made them before but, I can tell you, I will certainly be making them again. My recipe was adapted from this one in The Daily Telegraph. Preheat the oven to 300°F or 150°C and prepare a cookie sheet by lining it with parchment or a silicone liner. In a large bowl, whisk together the eggs with the sugar until they are glossy, turn a pale yellow and the sugar has started to dissolve. Use a microplane or small grater to zest the orange into the egg bowl and whisk again. Measure your flour into another bowl and add the baking powder and salt. Mix well. Sift the flour mixture into the egg bowl and stir with a wooden spoon until you get a soft dough. 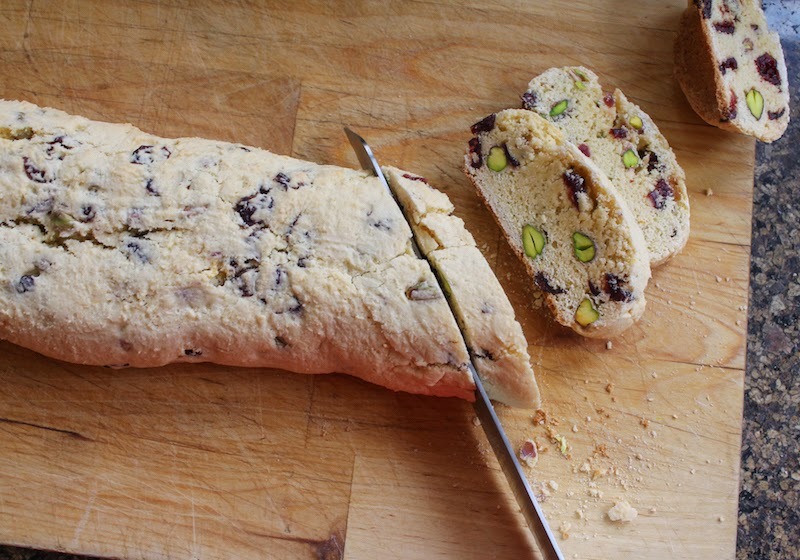 Add in the pistachios and cranberries and work them into the dough. 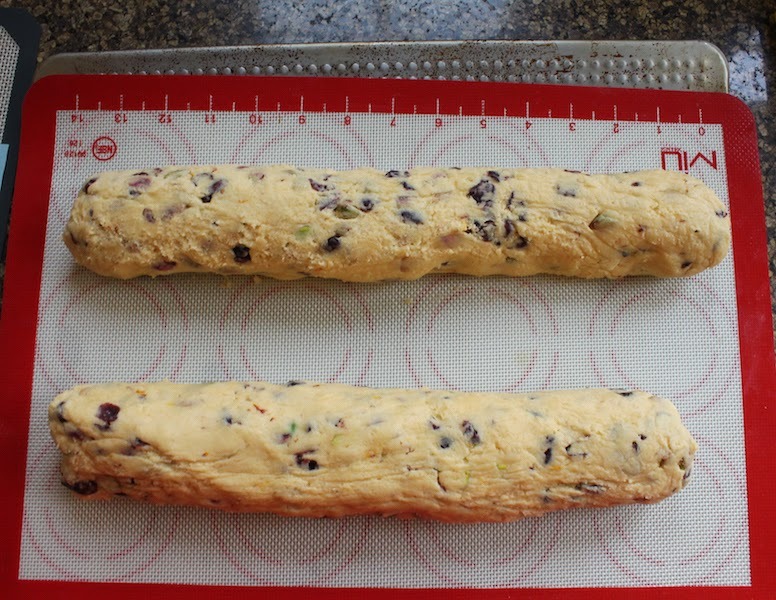 Divide the dough in half and roll the pieces into logs about 12-14 inches or 30-36cm long. 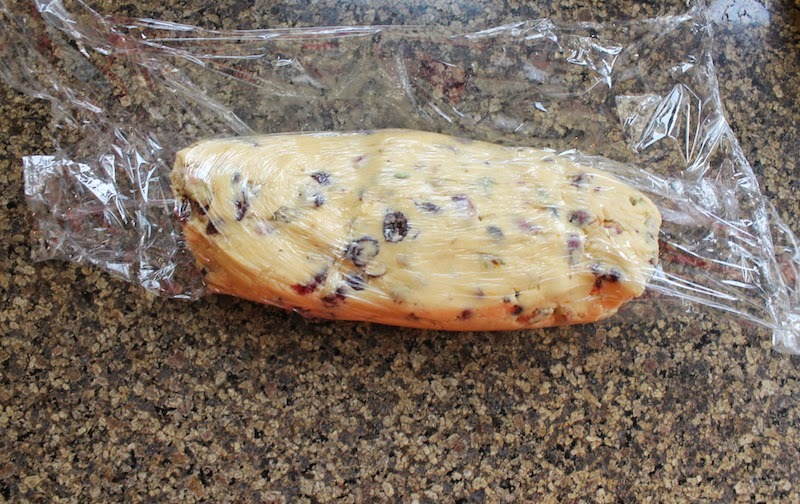 The dough is still rather sticky so I found it easiest to wrap it in cling film and shape it by pressing on the cling film until I reached my desired size and shape. Place the logs a few inches apart on your prepared cookie sheet and bake in the preheated oven for about 25-30 minutes. As you can see, one log is longer than the other. I decided not to care and you shouldn’t either. You want to make sure that the logs are baked completely through so, like bread, they should sounds a little hollow when tapped. Remove from the oven and allow to cool completely on a wire rack. I left mine for just over an hour so I turned the oven off when I took them out. Once the logs are completely cooled, preheat the oven to 300°F or 150°C again. Use a serrated knife to cut the logs into 1/2 inch or 1cm slices. 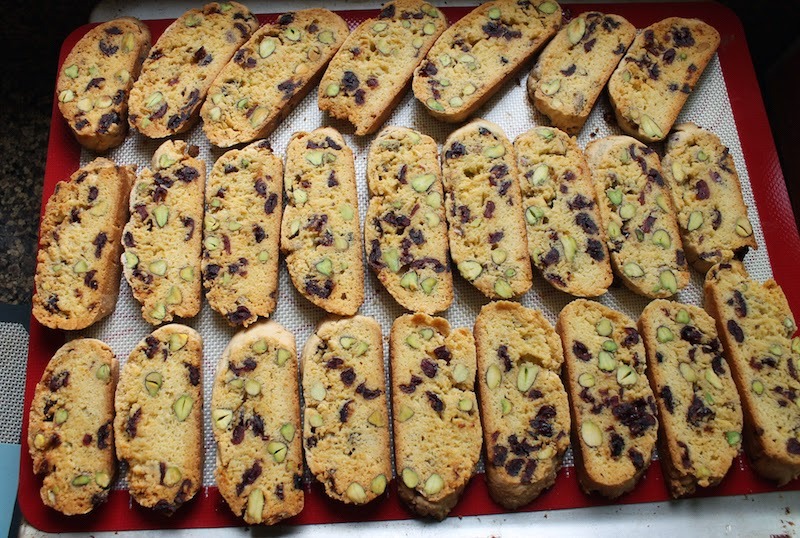 I cut mine on an angle so that the biscotti were longer. My helper dog and I shared the end bits but I still got 36 bake-able slices. Place your slices on cookie sheets and brush them with the melted butter. This is the first pan and it held 25 biscotti. The second small pan held only 11. Bake for about 10-12 minutes or until lightly golden. Are you ready for a virtual baby shower? 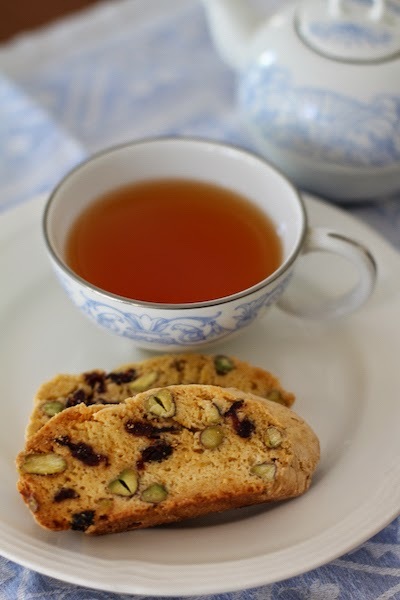 No gifts, just lots of love and biscotti! Many thanks to Lauren from Sew You Think You Can Cook for organizing this virtual baby shower for Tara! Check out all the other lovely recipes that have been made in Tara’s honor! The second in my candy bar series, made with Frey’s Caramel and Pecan milk chocolate, this sweet muffin has big dollops of caramel, just folded through the batter, leaving sweet golden streaks, and more than its fair share of toasted pecans. So I’m baking with my chocolate bar stash again. 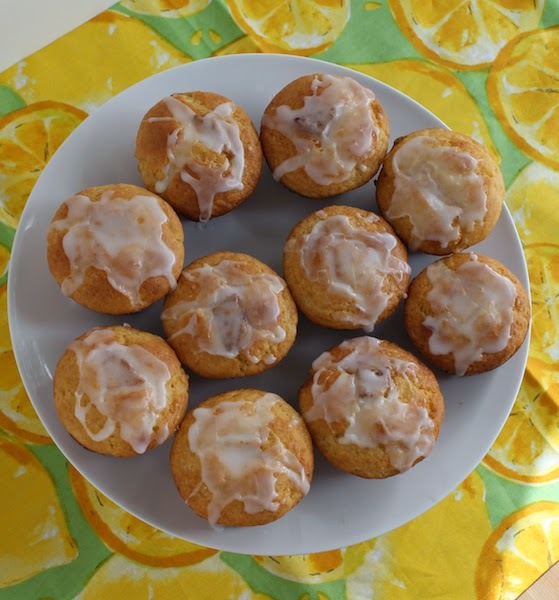 I take them out of the storage box and fan them out like playing cards, then choose one to recreate in muffin form, adding more of the key ingredients. I almost did maple-walnut but my walnut supply is low. So now you have that one to look forward to, if I don’t get to white chocolate-lemon first. Or dark chocolate with chili. I know, I know. But I’m having fun! 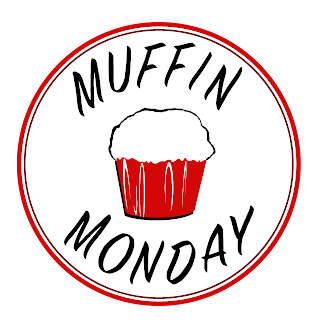 Preheat your oven to 350°F or 180°C and either grease a 12-cup muffin tin or line it with paper muffin cups. 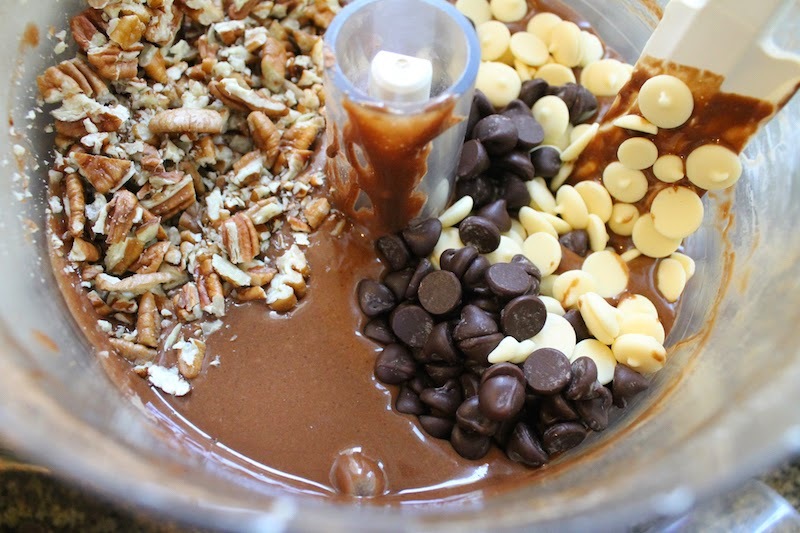 Chop your chocolate bar with a knife and put aside 12 chunks for decorating the tops of the muffins. Set aside 12 of the prettiest pecans and chop the rest up to add into the muffin batter. 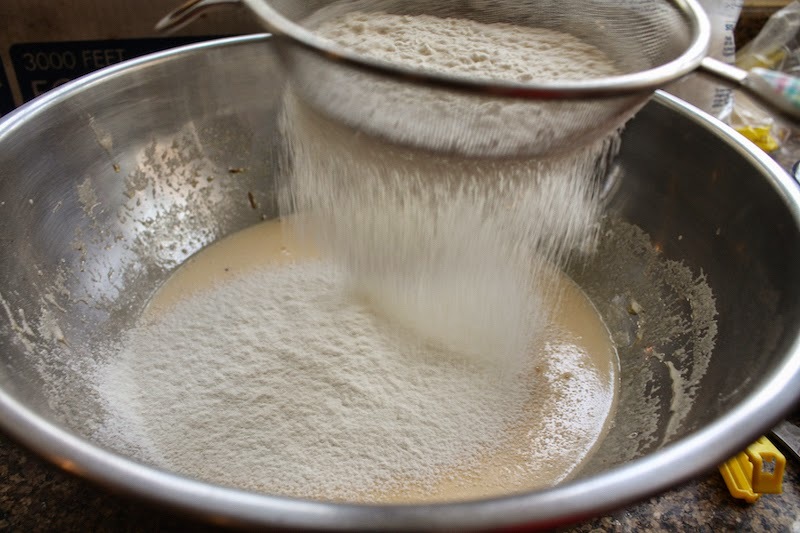 In a large bowl, stir together your flour, sugar, baking powder and salt. 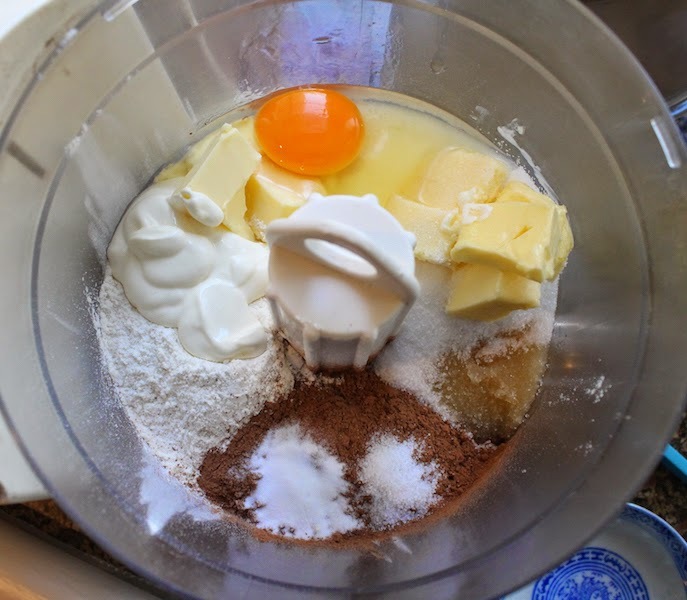 In another smaller bowl, whisk together your eggs, milk, melted butter and vanilla. 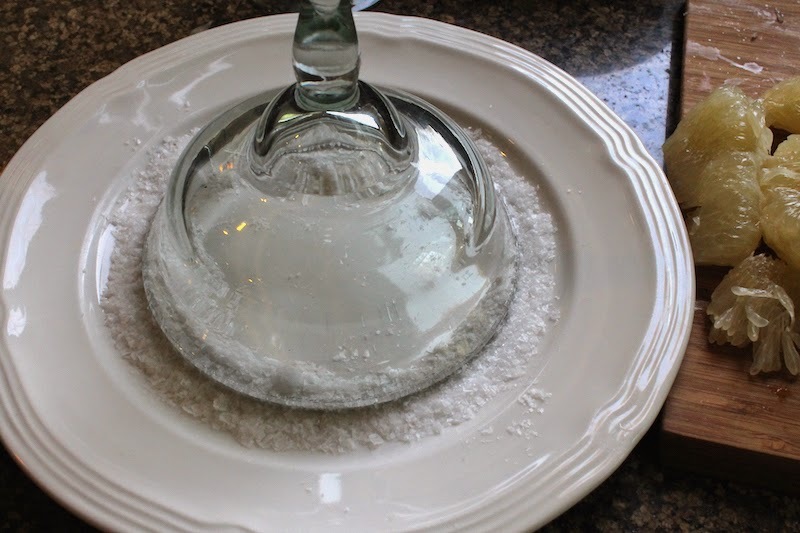 Fold your wet ingredients into your dry ones. Stop when there is still quite a bit of flour still unmixed. Fold in the larger pile of the chopped chocolate bar and the chopped pile of pecans. Drop the caramel in spoonfuls all over the top of the batter. Fold it in, trying not to stir too hard. You want to see big golden streaks of caramel in the batter still. Divide the batter between your prepared muffin cups. Top each with a piece of chocolate and a pecan. 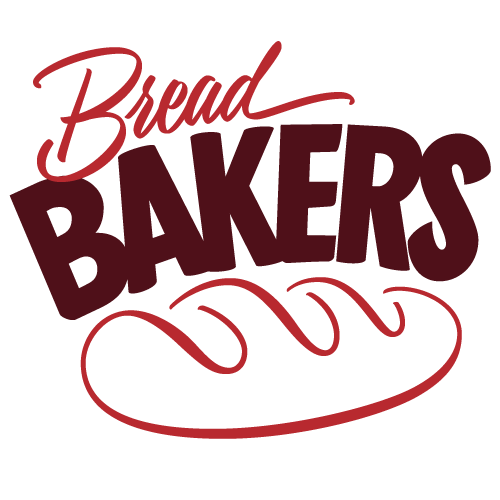 Bake in the preheated oven for about 20 minutes or until a toothpick stuck in the middle comes out clean. Allow to cool for a few minutes in the pan and then remove to a wire rack to cool completely. Once cool, drizzle on a little more caramel if desired. 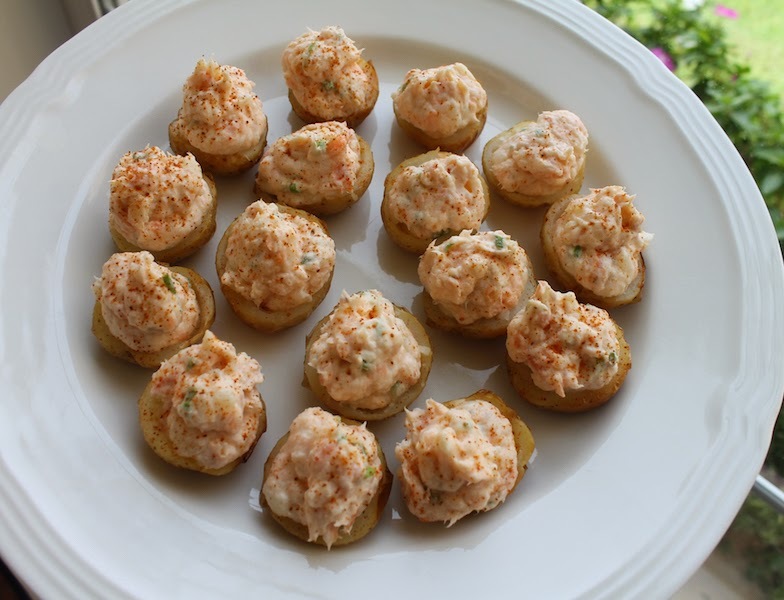 Baby potatoes, baked till tender then stuffed with sour cream, chives and smoked trout, are a great make-ahead appetizer for any party. What a fabulous day it is today! 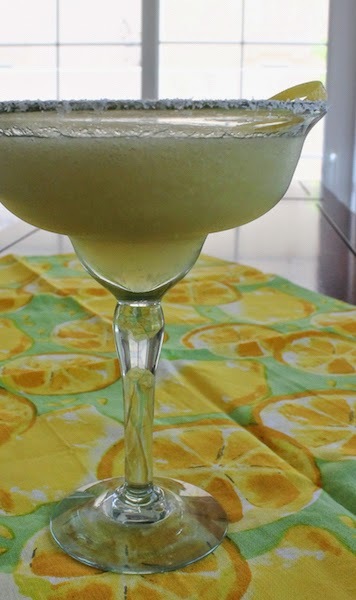 Not only is it National Margarita Day, but my Sunday Supper group is getting ready for the Red Carpet and the Academy Awards by bringing you wonderful recipes for drinks and dishes perfect for any party. Our host for this great event is Katie from Ruffles and Truffles. Since I’m hours and hours ahead of the US here in Dubai, the Oscars will be on live at 5:30 a.m. Monday morning for me. I’ve got it set up to record and I’ll watch while I sip coffee and eat my breakfast at a more reasonable and civilized time. After all, those award ceremonies are all about the glitz and glamor and I can’t imagine feeling glamorous at 5:30 a.m. and certainly not before the first cup of coffee! Ingredients for 16 stuffed potatoes - This recipe is easily doubled or trebled. Preheat your oven to 350°F or 180°C. Give your baby new potatoes a good scrub to make sure they are clean. 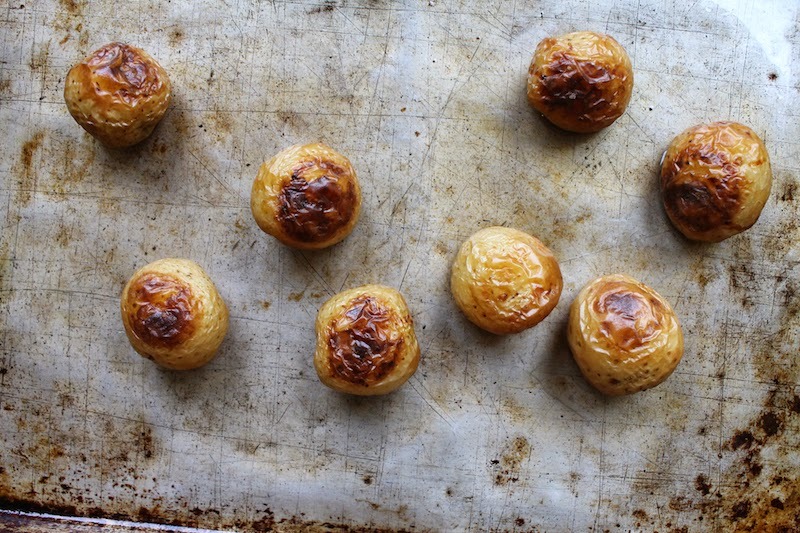 Dry them thoroughly and then put them in a baking tray and drizzle them with olive oil. Bake them for about 30 minutes or until they are tender all the way through. Leave them to cool. 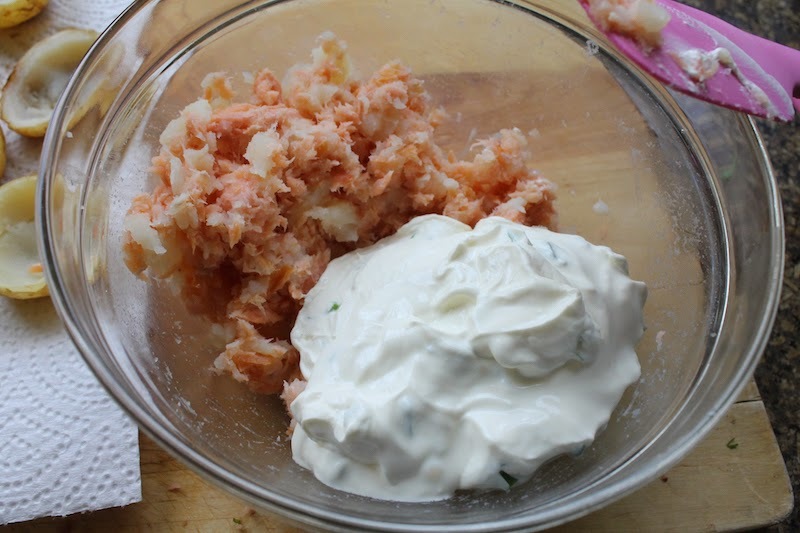 Meanwhile, mince your chives and add them to the sour cream. Stir well. 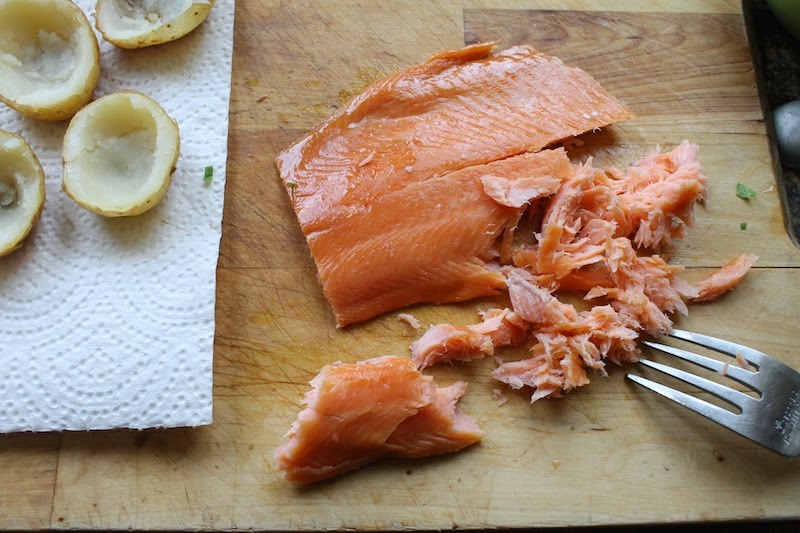 Use the tines of a fork to flake your smoked trout. 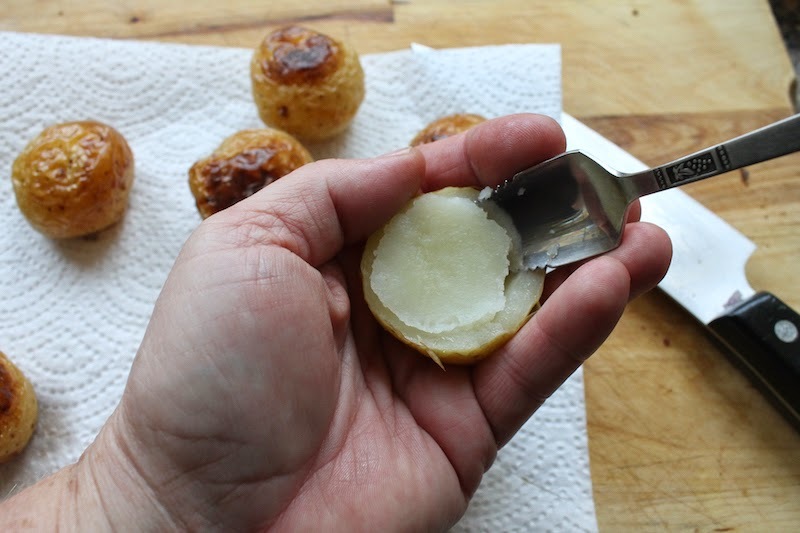 Once the little potatoes are cool enough to handle, cut them in half and scoop out the insides, leaving enough potato inside the skin so that they form little bowls. I used a grapefruit spoon. 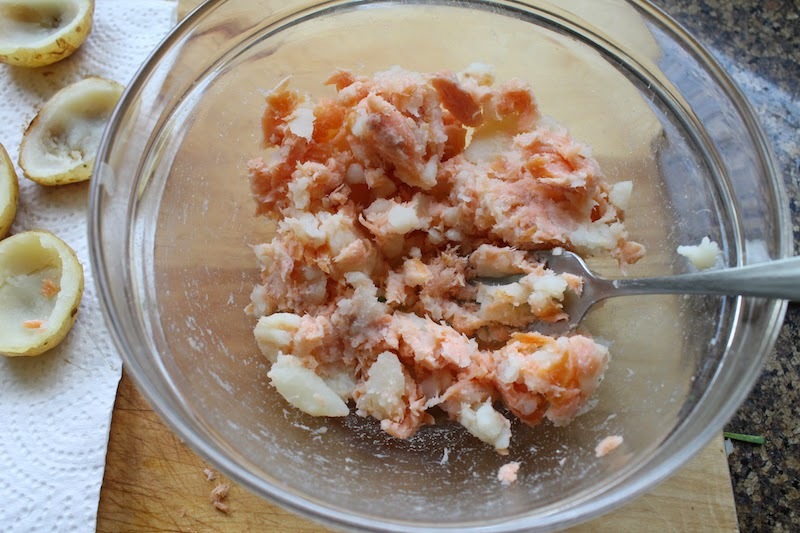 In a small mixing bowl, combine your flaked trout with your potato insides and stir well. 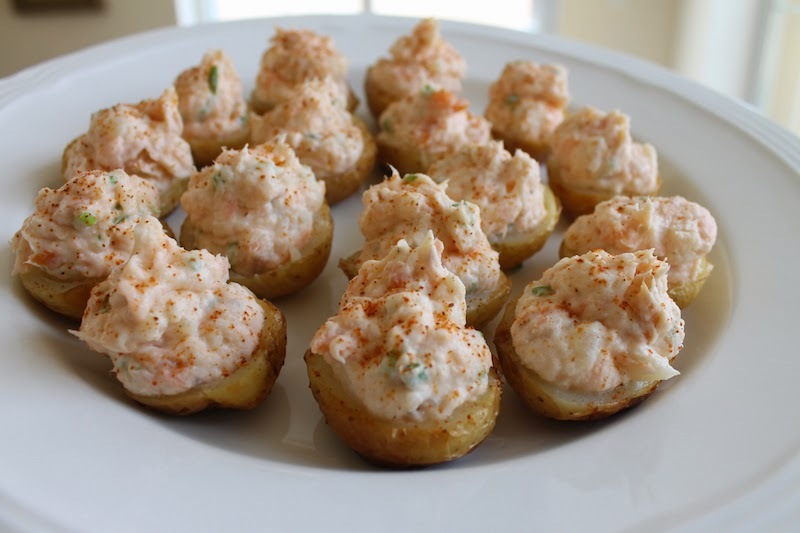 Fold in the sour cream with chives. Taste the mixture and add salt and freshly ground black pepper to taste. 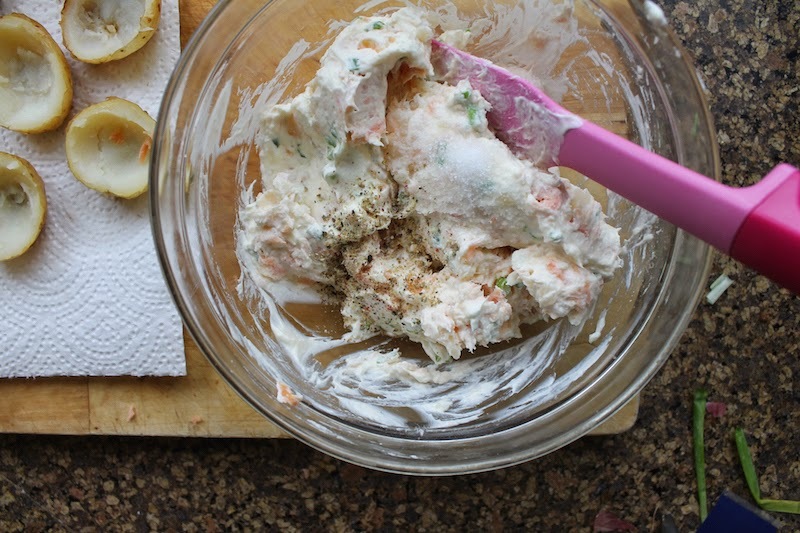 Some trout is saltier than others so you have to use your own judgment. 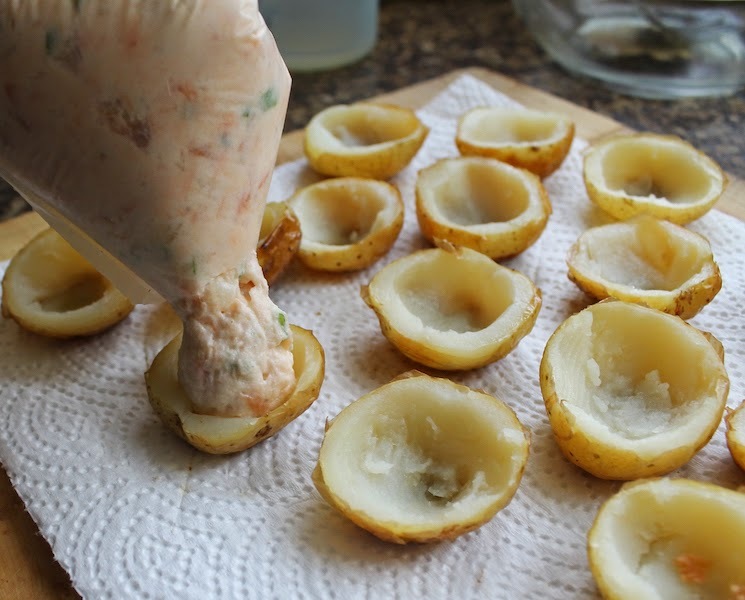 Spoon the filling into the potato halves or use a plastic bag with a corner cut off to pipe it in. Sprinkle with a little cayenne pepper. Keep refrigerated until ready to serve. 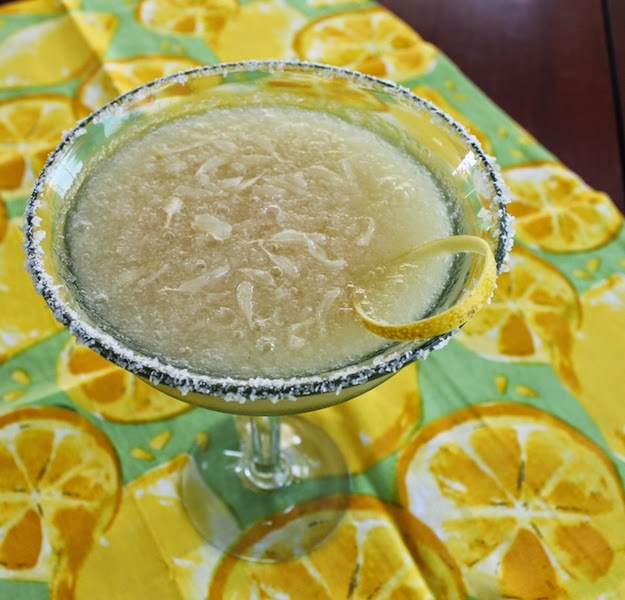 Whole chunks of juicy pomelo blended with demerara simple syrup, tequila and Grand Marnier make a refreshing margarita, perfect for the National Margarita Day celebration. As I’m puttering about the kitchen, cooking and baking and cleaning up after myself, I either listen to music or podcasts that don’t take a whole lot of concentration to follow. One of my favorites is Spilled Milk, presented by Molly Wizenberg and Matthew Amster-Burton, where they cook and eat food, and, as they say, we listeners don’t get any. I always learn something from those two and enjoy a few laughs as well. 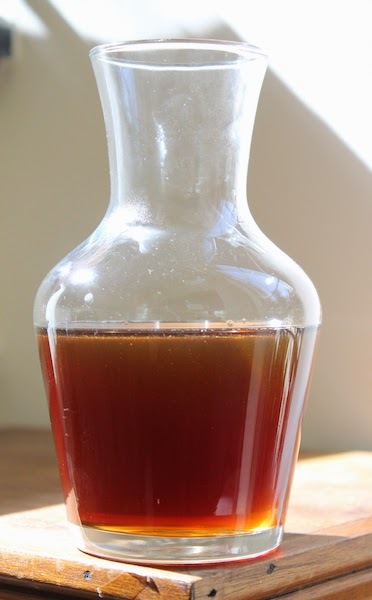 For instance, in the podcast Classic Cocktails, I learned that many bars are using different sugars, like muscovado or demerara, in their simple syrups, which add depth of flavor along with the necessary sweet component in cocktails. Some bars amp that up by making what they call “rich” syrup instead of simple syrup by doubling the amount of sugar instead of using the normal 1:1 sugar/water ratio. Intriguing! 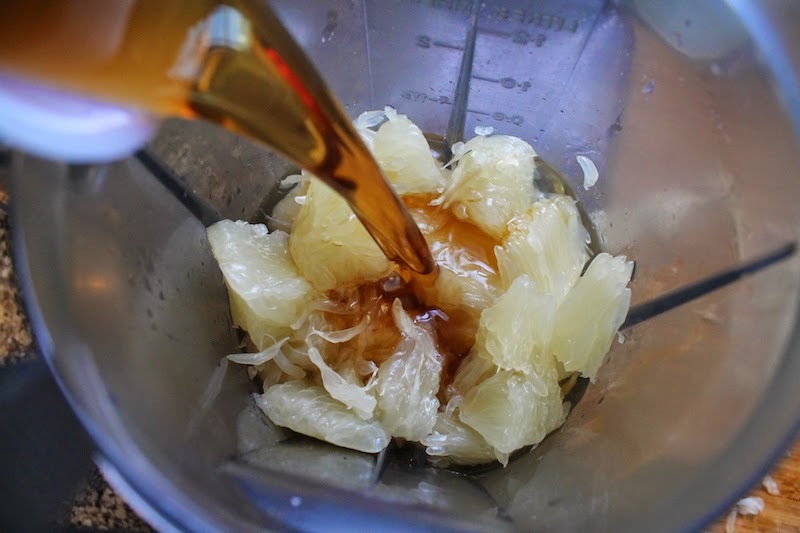 That program came back to me when I read that crunchy demerara sugar is great to sprinkle on pomelo and I decided to use it to make my simple syrup for pomelo margaritas. 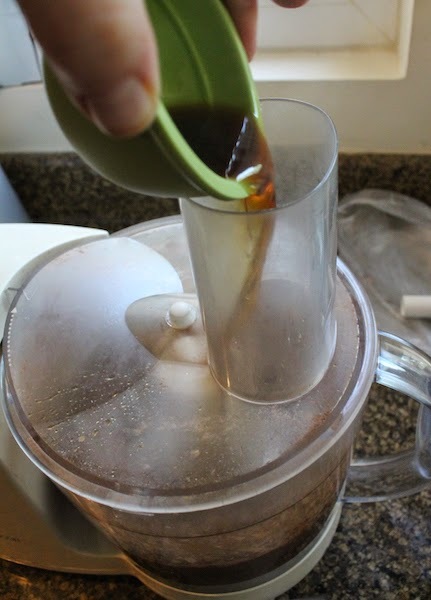 It was an excellent choice and I may never make plain white sugar simple syrup again. Which brings me to the point of this post, the National Margarita Day celebrations, organized and hosted by Heather of girlichef! Make sure you scroll down to the bottom and check out all the great drinks and tasty treats we are sharing today! 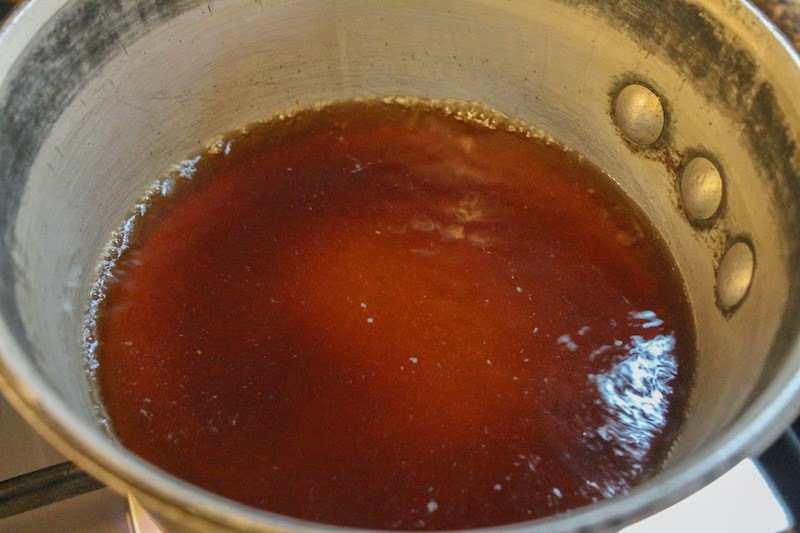 To make the simple syrup, warm your water and sugar in a small pan on the stove, stirring until all the sugar has dissolved. Remove from heat and allow to cool. This can be stored in the refrigerator in a clean jar almost indefinitely. 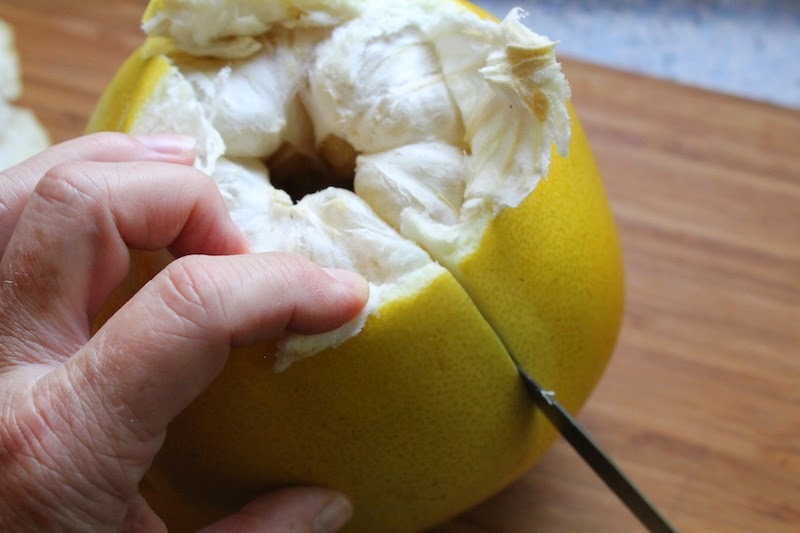 Peel your pomelo by feeling for the indentation of where the fruit starts at the stem end. Cut the end off right about there. 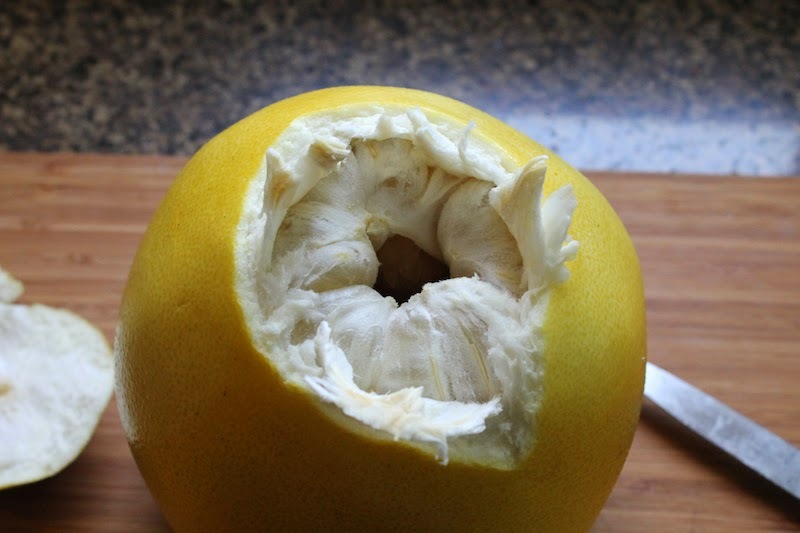 Open the hole at the top so you can see where the division of the slices are. 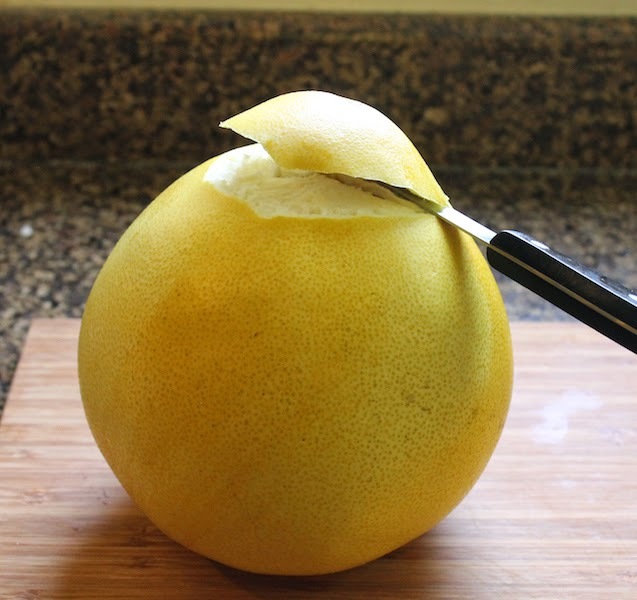 Make vertical cuts in the peel from top to bottom between the slices. 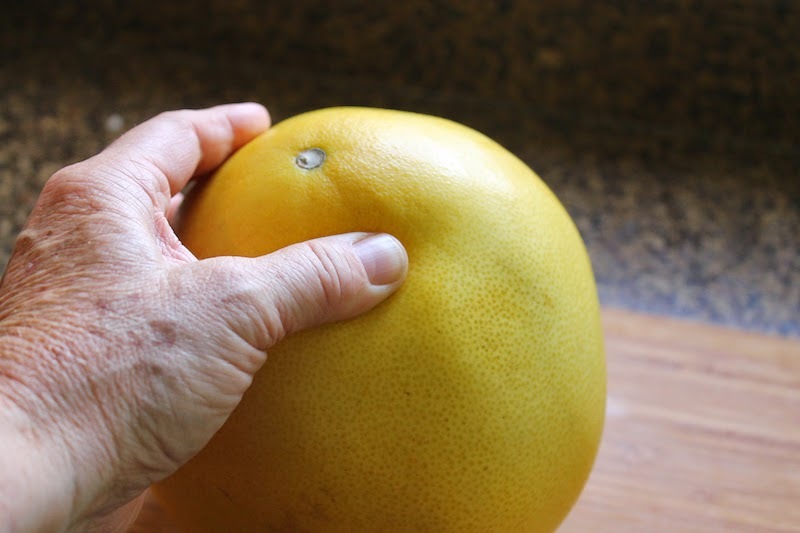 Peel back the thick skin to reveal the fruit inside. 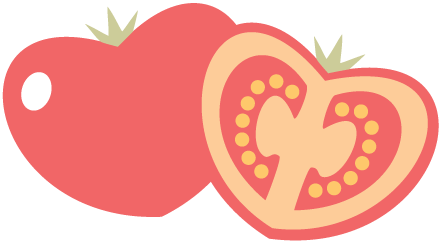 Now separate the pegs or slices and remove the thick membrane from each. Cutting the top off of with scissors will open the membrane up so it can be more easily removed. 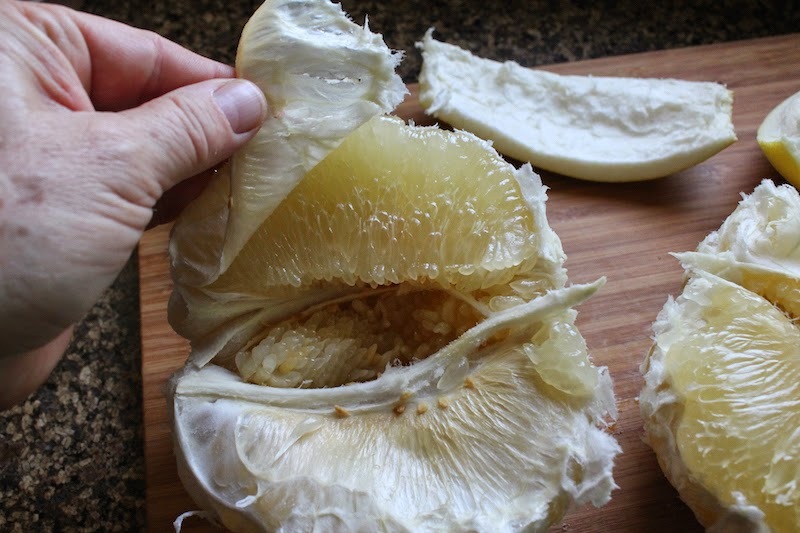 If any white pith is stuck to the fruit, slice it off with a sharp knife. 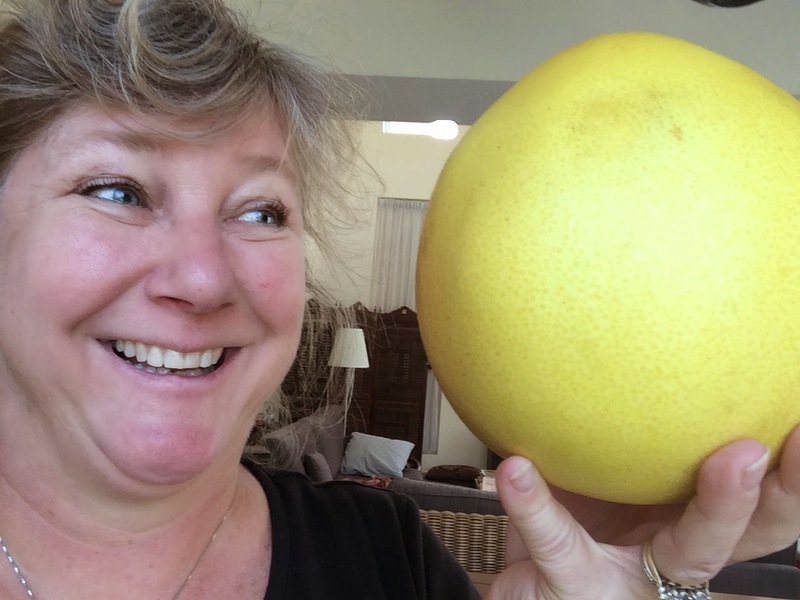 My pomelo was a huge guy, weighing 1.5 kilos or 3 lbs 5 oz. and he was almost as big as my head. After peeling and removing all the pith, he was still just over one kilo or 2.2 pounds - big enough to make two blenders of frozen margaritas. Seriously. Almost as big as my head. 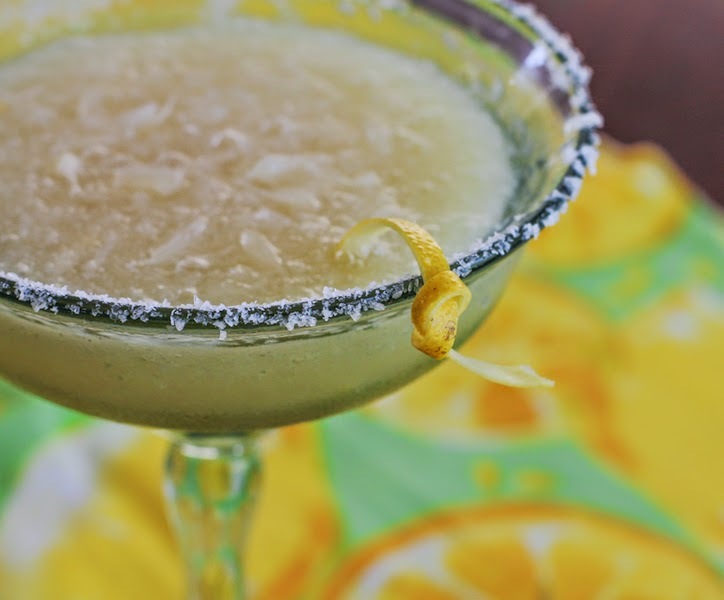 To blend the margaritas, put the chunks of carefully peeled pomelo in your blender along with the tequila, Grand Marnier and simple syrup. 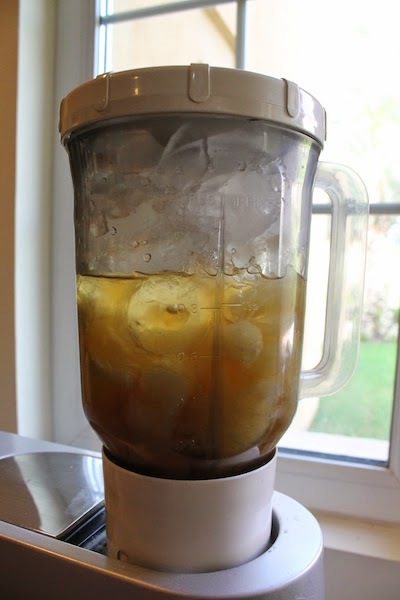 Fill the blender with ice and blend until smooth. 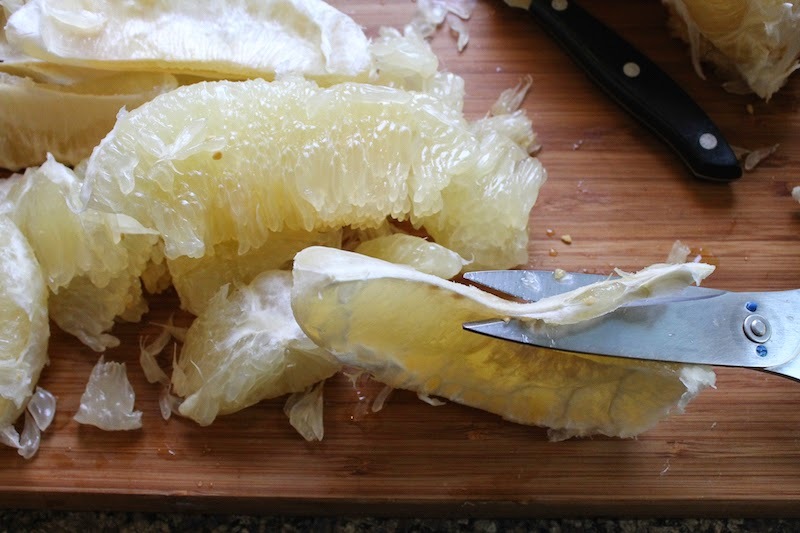 Run a spare piece of pomelo around the rim of your glasses and dip them in flakey sea salt to coat, if desired. Pour your pomelo margarita into your prepared glass and garnish with a bit of pith-free pomelo peel and a sprinkle of some of the loose pomelo pips, if desired. Enjoy! 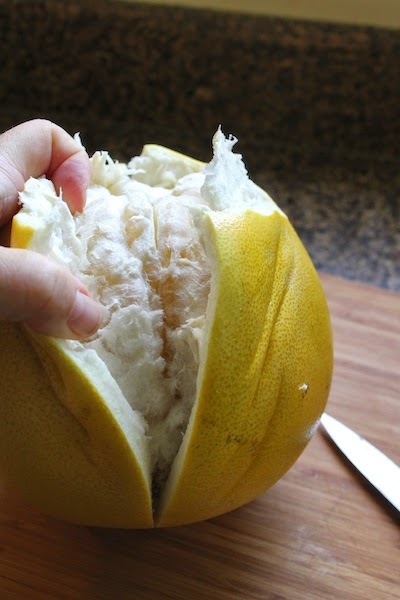 If you’ve never tried pomelo, it tastes like a cross between an orange and a grapefruit, with a milder bitterness than grapefruit. 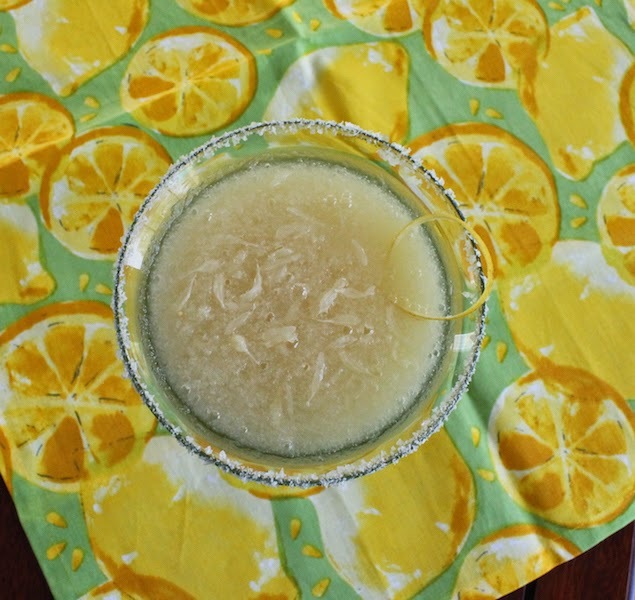 How are you celebrating National Margarita Day? Might I suggest some of these delicious options? 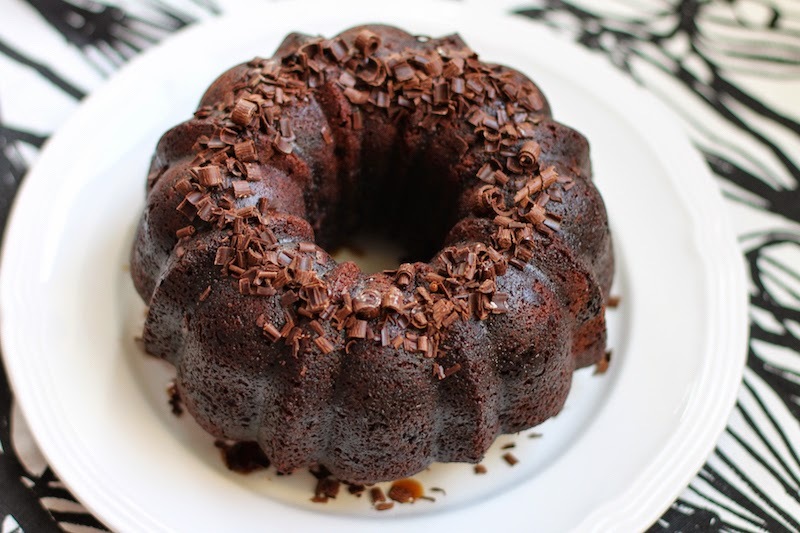 Cocoa, chocolate chips, chocolate syrup, chocolate curls on top all combine to make this most chocolatey of Bundts, with added flavor from pecans and coffee. It was 2008 and I had been crushing hard on Nigella for several years. I tell you, as far as I was concerned, that woman could do no wrong in the kitchen, plus she did it all with insouciance and nary an apron in sight. Yet, she was always immaculate and perfectly coiffed. I get that she had staff for a clean kitchen but how did she manage not to get herself dirty? I certainly can’t do it. Anyhoo, we had just moved down the road from Kuala Lumpur to Singapore and our girls were able to take the fancy bus - airplane-type seats and Subway packed lunches served en route - back to stay with friends. Houseguests should always bring gifts, so I’d send them with jars of tomato chutney or Nigella’s Quadruple Chocolate Cake because it’s baked in a loaf pan and travels well when wrapped in cling film and foil. I have since brought Nigella’s cake to potlucks and parties on at least three continents. 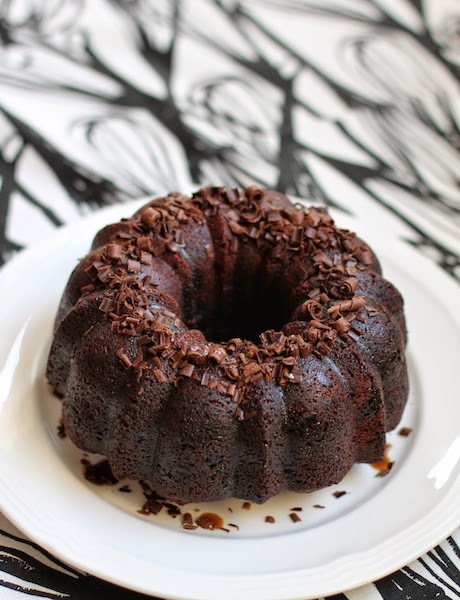 When our host for this month’s Bundt Bakers, Tanya of Dessert Stalking, chose chocolate as our theme, I knew immediately that I wanted to adapt that cake to bake in my newest small Bundt pan, the 6-cup Nordic Ware Anniversary pan, a birthday gift last month from me to me. (Oh, no, really, you shouldn’t have. It’s too much! – But I insist! Happy Birthday! – Well, if you insist. Thank you!) 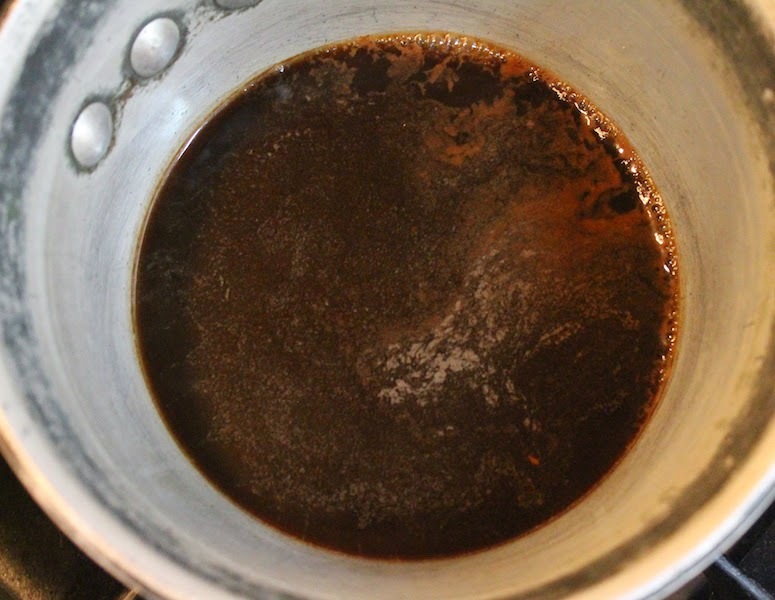 And because the original recipe called for water for the batter and the syrup, I used coffee. And added pecans. Because pecans and coffee make everything better. 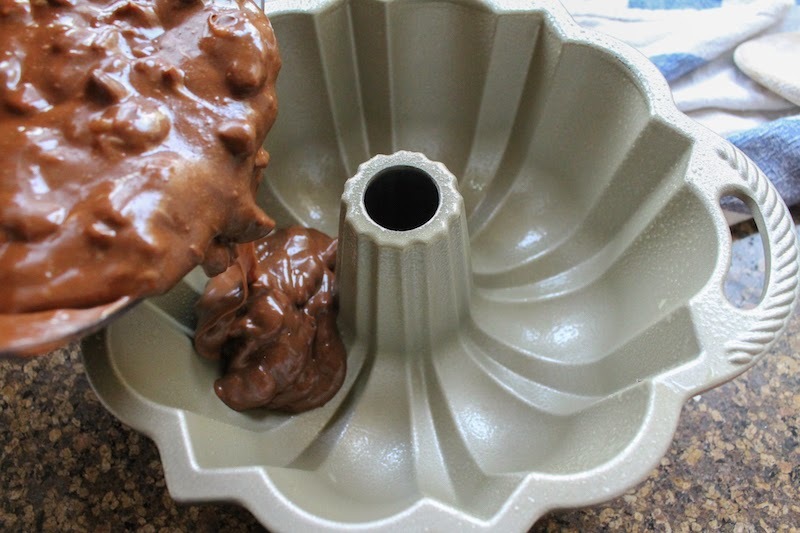 For the batter to fit a 6-cup Bundt pan. Or double to bake in a normal Bundt pan and increase the baking time accordingly. 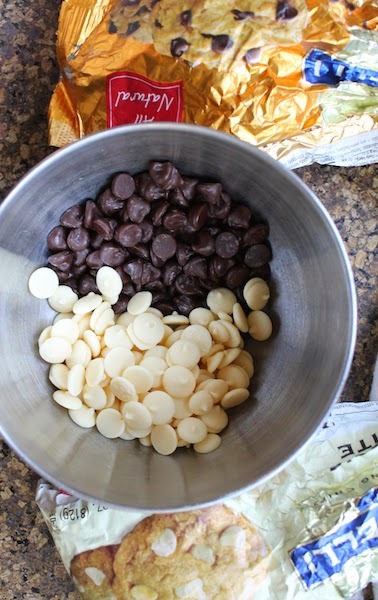 Topping - shavings of dark chocolate – use the bar of your choice. Remove all your ingredients from the refrigerator and allow to come to room temperature. 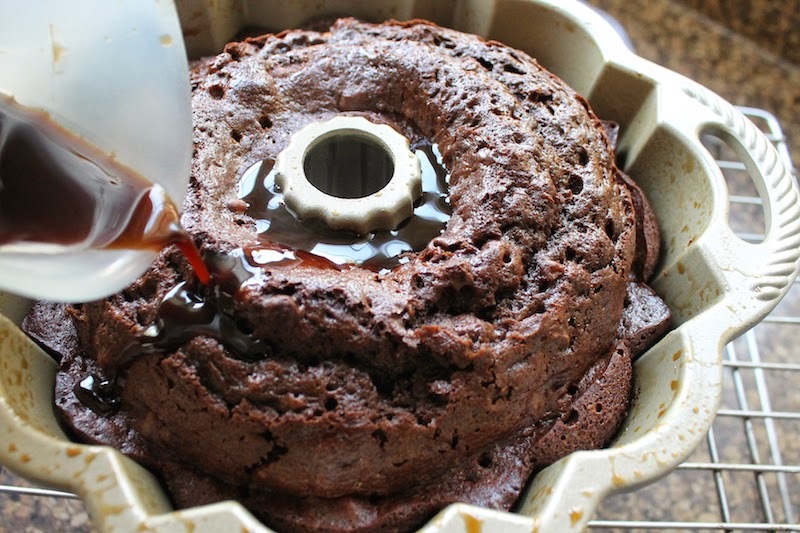 Prepare your Bundt pan by greasing and flouring it or use the non-stick spray that has flour already in it. 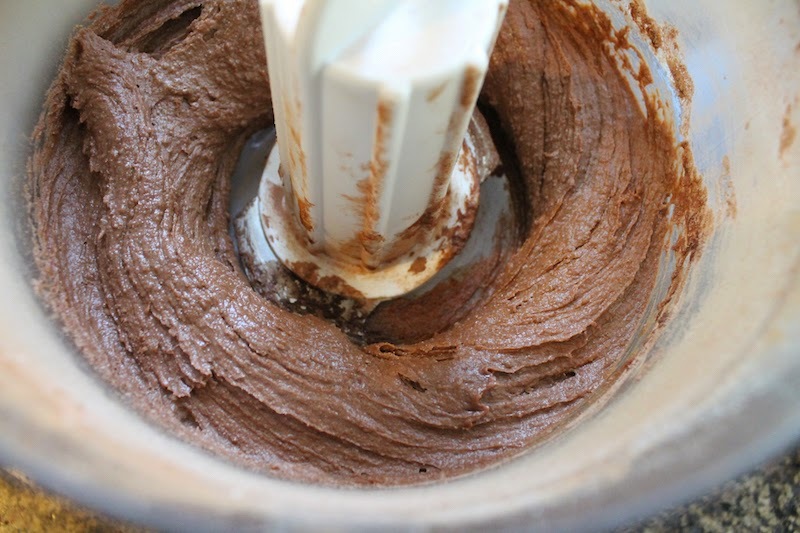 Measure the flour, sugar, butter, cocoa, egg, sour cream, vanilla, baking soda and salt into your food processor. Pulse till everything is well combined and smooth. While it’s whirring, pour in the very hot coffee. Try not to be alarmed at the sudden increase in speed of your processor as the hot coffee mixes in and the batter thins. Scrape down the sides and fold in the chocolate chips and chopped pecans. 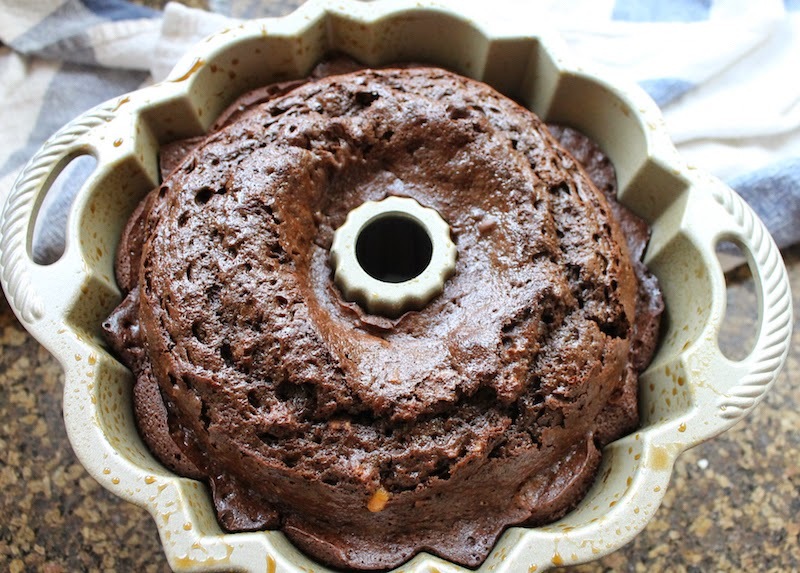 Pour the rich batter into your prepared Bundt pan and bake for about 35-40 minutes in your preheated oven. 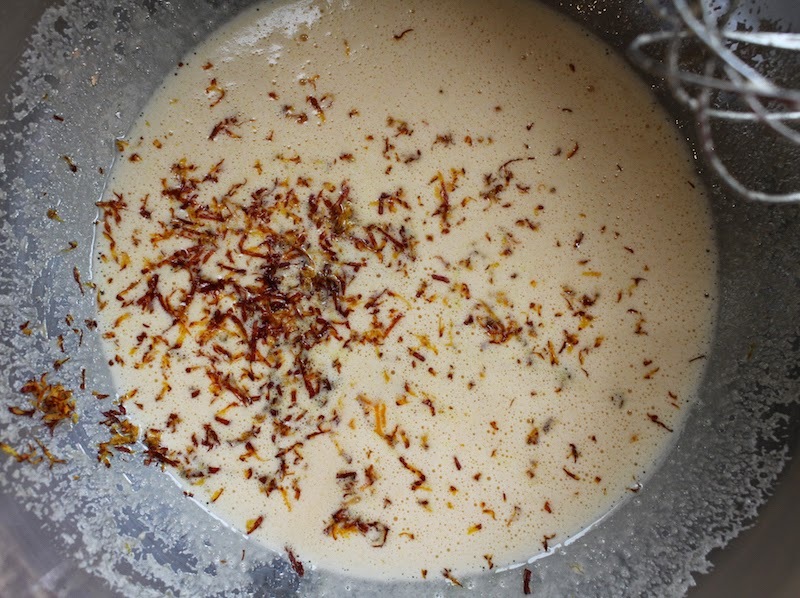 About 10 minutes before the cake is due out of the oven, put your syrup ingredients into a small pot, mix well and boil for about five minutes or until the liquid reduces by almost half and thickens slightly. It will thicken more as it cools. 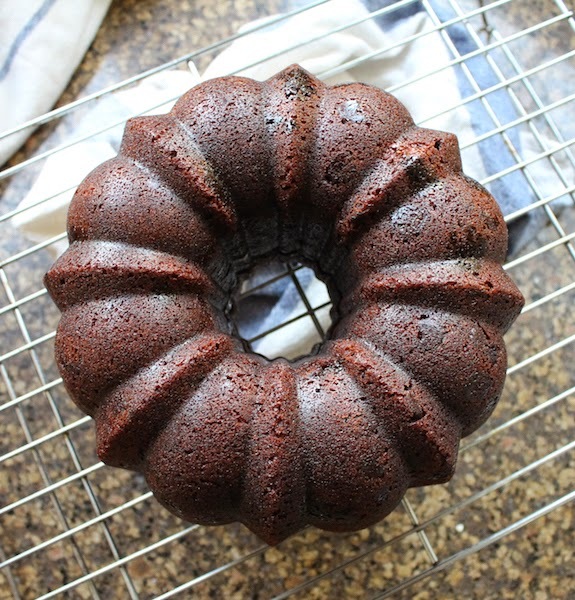 Take the Bundt out of the oven and let it cool on a wire rack for about 10 minutes. Then turn it out of the pan, just to make sure it will. I have yet to be disappointed by a Nordic Ware pan not releasing but one can never be too cautious when it comes to Bundts. Now put it carefully back in the pan and poke it all over with a skewer. Pour all but a few tablespoons of the syrup over the cake and around the sides, and leave it to soak in. 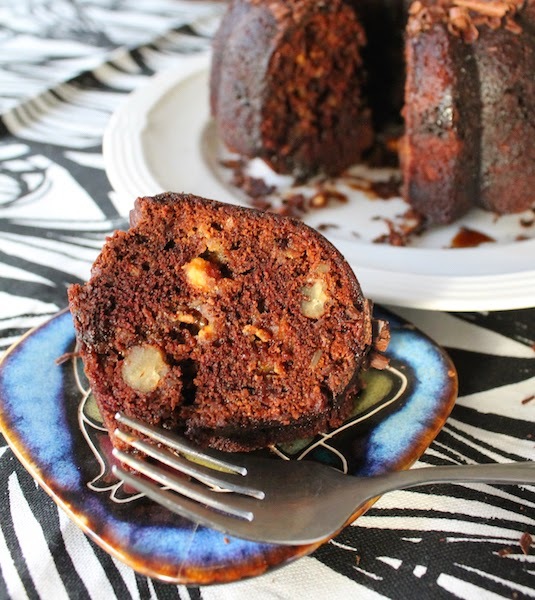 When it’s all soaked in, turn the Bundt out again and put it on your serving plate. 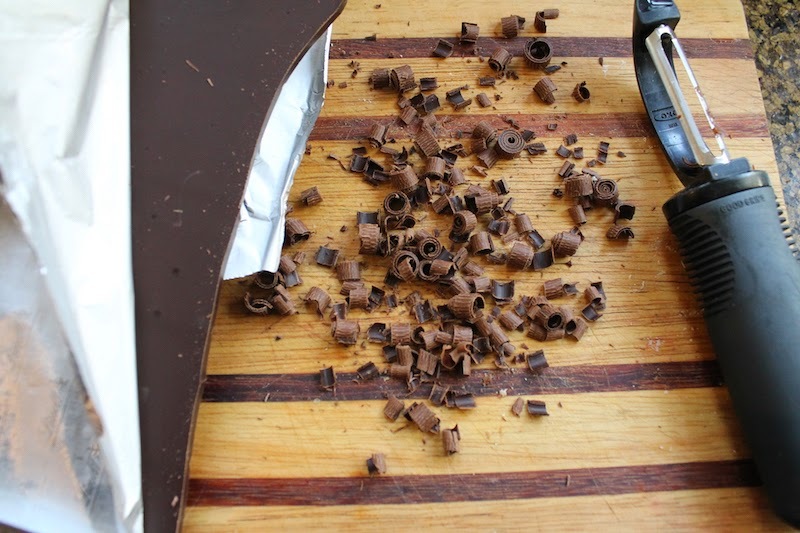 Use a vegetable peeler to make chocolate curls out of part of your chocolate bar. 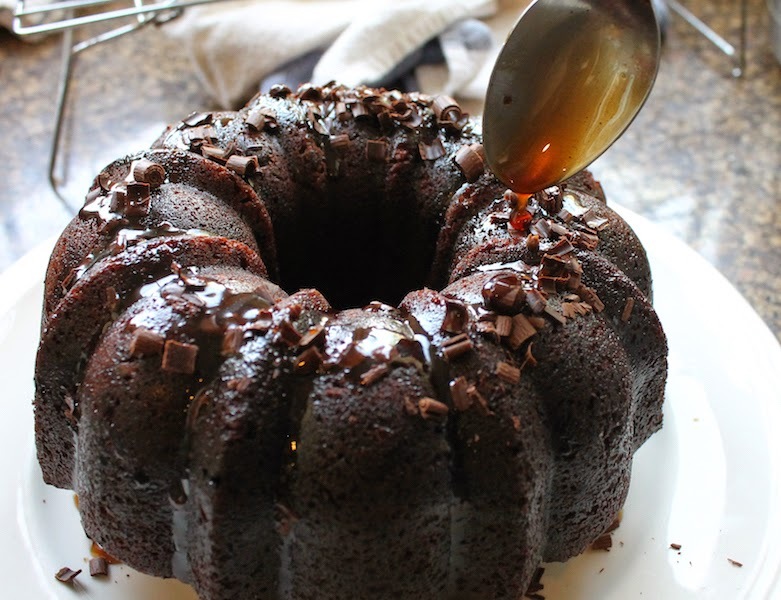 Spoon the balance of the syrup over the top of the Bundt and top with the chocolate curls, alternating sprinkling with spooning so the chocolate curls will stick. 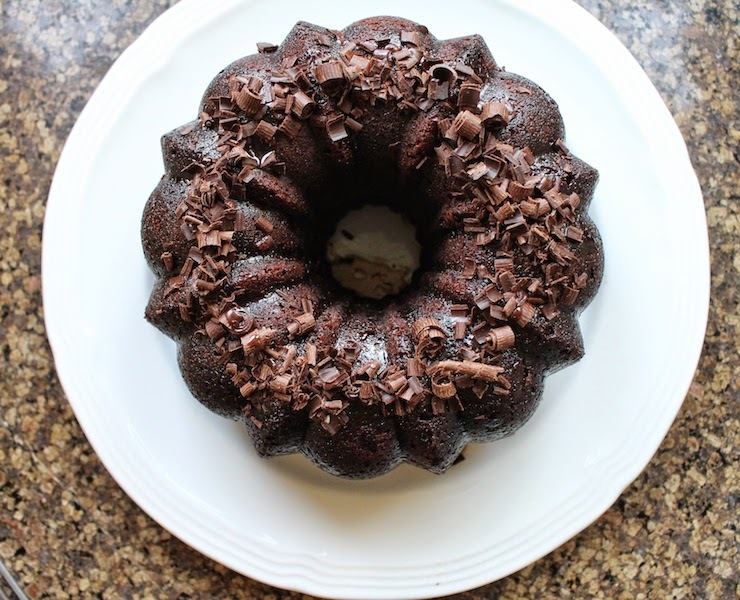 Are you a fan of chocolate Bundts? 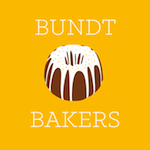 Check out the great recipes Bundt Bakers has for you this month!